Using dew heaters with your astrophotography rig can be the difference between capturing hours worth of exposure time on a target, and coming up empty-handed (Trust me). Dew prevention is an essential precaution needed for long exposure imaging sessions and is something you will inevitably need to address at one point or another. 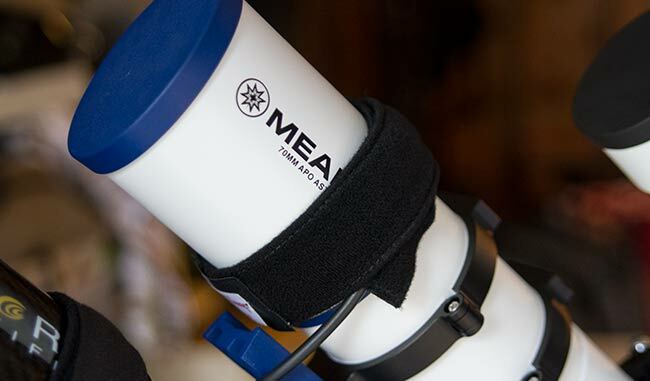 There are a number of solutions available for keeping your telescope objective moisture-free. If you have ever felt the sting of an imaging or observing session spoiled by dew, the good news is that there are many effective solutions available. These range from dedicated tools designed specifically for moisture prevention, to free methods using everyday household items. 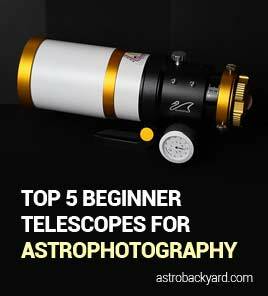 Ultimately, the method you choose will depend heavily on the type of telescope you are trying to keep dry. I shoot primarily with refractor telescopes like the Explore Scientific ED102, which are quite easy to manage due to their small size and retractable dew shields. 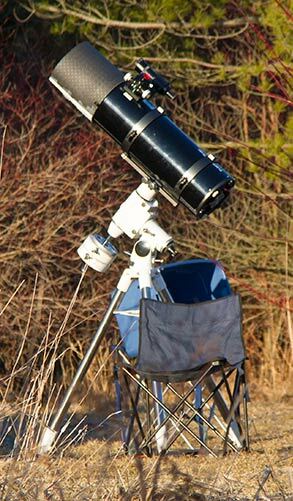 Those who shoot with an SCT (Schmidt Cassegrain Telescope) or Newtonian reflector will need to take extra precautions to keep the optics free of moisture on their larger optical surfaces. Before we look at a few solutions, let’s take a look at what causes dew to form. What causes dew on a telescope? When the surface of your telescope objective or camera lens drops below the ambient temperature of the air outside, moisture begins to condense. On a night with high levels of moisture in the air, dew forms even more aggressively. A telescope that has been “dewed-up” no longer captures clear images of your deep sky target, and instead captures a washed out featureless image that resembles a flat frame. A dew shield can effectively delay the process of dew forming on your optics, but it won’t stop it completely. It reduces the angular amount of sky seen by the telescope objective and can keep moisture at bay for an extended period of time. As an added benefit, a dew shield can increase the contrast in your images by acting as a light baffle. A dew shield blocks stray light from entering the telescope lens, and can also protect it from any dust and dirt in that is stirred up around the telescope. Most of the refractor telescopes I have used include a built-in, retractable dew shield, such as the William Optics Z61, and Explore Scientific ED102. I have also constructed a homemade dew shield for my Newtonian reflector using a soft foam flooring material similar to a camping mat. When setting up for a night of astrophotography, I make sure to wrap my primary imaging telescope with a dew heater strap. 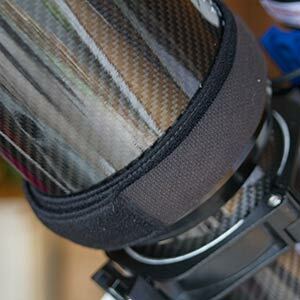 The strap is powered via a dew heater controller to adjust the amount of heat generated by the strap. I also put a dew heater band on my guide scope, as a moisture can develop on that telescope as well, and affect autoguiding performance. 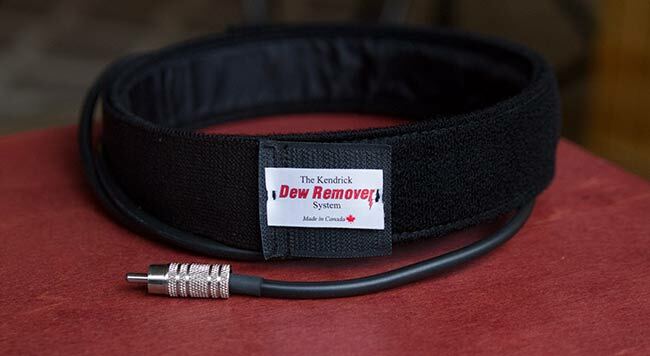 The brand of dew heaters I use is Kendrick Astro Instruments, they are a Canadian company, and produce some of the highest quality dew heaters on the market. They make a number of dew removal products from affordable dew heater straps to advanced controllers and power packs. Power consumption is always a concern when it comes to a portable astrophotography rig, so make sure you choose an option that covers your needs without using more power than you need. The Firefly Heaters offered by Kendrick are designed to save power and operate from 12 Volts DC. Many dew heater controllers include a temperature sensor that can aid in an effective level of power consumption. I use a simple dew heater controller and strap system on my main astrophotography setup and often transfer the system to other rigs. In my review of the iOptron SkyTracker Pro camera mount, I wrapped a dew heater strap around my wide angle camera lens to keep it dry. A dew heater band should be wrapped around the base of the objective lens, at the bottom of the dew shield (if applicable). 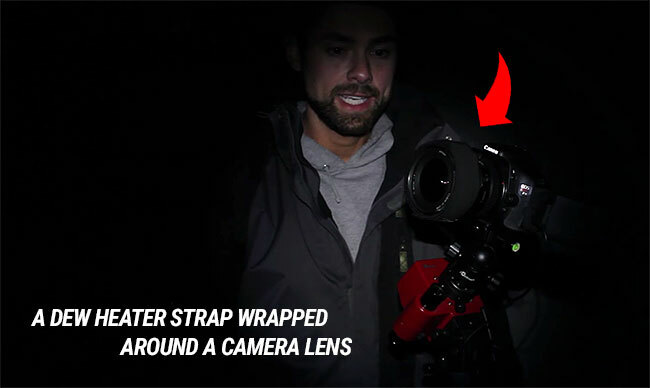 The same applies when using a dew heater strap with a small camera lens. Without the heat generated from the dew heater, your camera lens may fog up as early as 5 minutes into your imaging session! 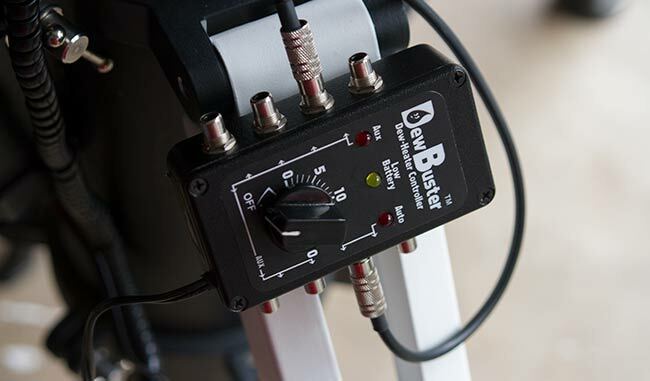 The dew heater straps are controlled with a dew heater controller, such as the standard model DewBuster controller I use. This controller has 10 RCA jacks offering different levels of temperature output. I usually use the medium power outputs when heating the bands on my imaging and guide scope. Another popular dew controller is the Orion Dew Zapper Pro 4-Channel Control Module, that features individual dials for each of the 4 output jacks. The medium power jacks offer a steady output of heat to the bands that effectively keep dew from my optics all night long. The dew heater controller includes a cigarette lighter plug power cord that I plug into my battery pack or adapter unit. Although the unit includes a temperature sensor, I have not used this feature yet. The temperature sensor reads the current ambient temperature and sends the appropriate amount of heat to the dew heater to handle power more efficiently. 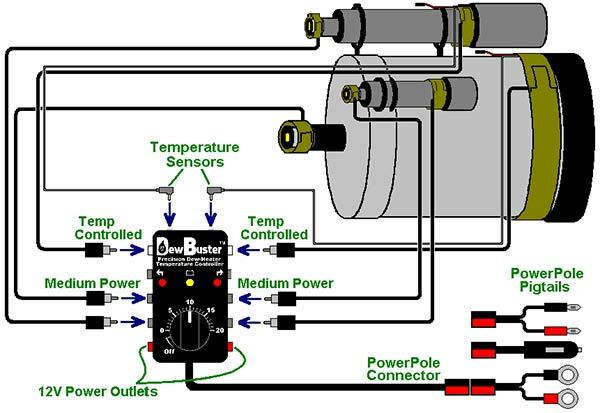 Below, is a diagram of how the DewBuster controller sends heat to various dew heater straps. As mentioned earlier, I stick with the medium power outputs when controlling the bands on my refractor telescopes. I am very satisfied with my Kendrick brand premier heaters, running on the DewBuster controller. I urge you to investigate these products further to get the best possible solution for your specific setup. The dew heater bands come in many sizes, so be sure to get the right length for the telescope you plan to use it on. Larger telescopes such as the Dobsonian design may benefit from a primary mirror heater. 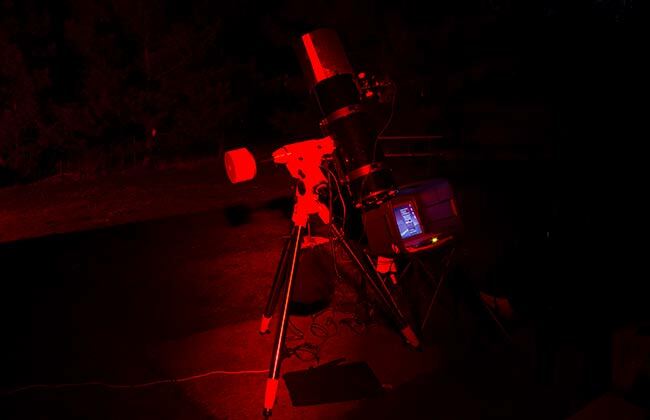 There are also secondary mirror heaters prevent dew from ending a night of observing. Newtonian reflectors often use fans to prevent moisture build-up. Read more on this subject by Gary Seronik. If you don’t have a dew heater system yet, you may be able to get by using a household blowdryer. I have used this method in the past when I was desperate to clear the moisture from my optics. This isn’t an ideal option, as dust and debris can be blown from the hairdryer and stick to the moisture as it dries. Hairdryers are also notorious for using a dangerously high amount of power, that can drain your battery in a hurry. I would only suggest using this option if you are imaging from home and connected to household AC power. A good blow using heat will dry your telescope or camera lens in about a minute or two. You can also leave a fan running in the direction of your equipment to keep the air moving, and condensation from settling on your gear. This method has many of the same drawbacks as the hairdryer technique in terms of power consumption and efficiency. 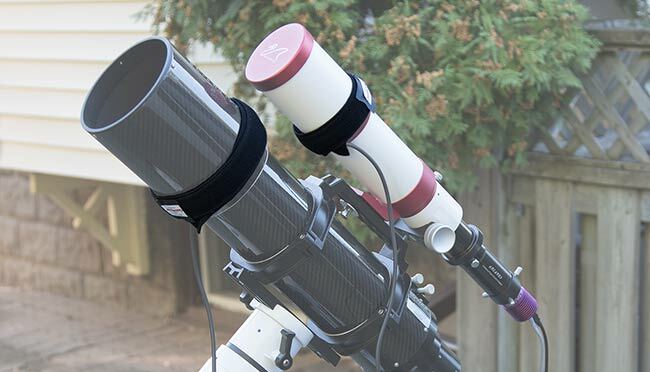 I hope that you can see the value of using dew heaters for astrophotography, and how this simple step can ensure that your telescope is able to capture clear images all night long. No matter which system you decide to use, just remember to turn it on – and avoid the heartbreaking realization that you have squandered hours of imaging time under clear skies! I use dew heater bands on all of my astrophotography configurations from my primary imaging setup to my portable deep sky kit. If battery power consumption is an issue, be sure to have a reliable source of power for mobile imaging sessions established before adding dew heaters.